The story shared below is done so with permission given by the patient. 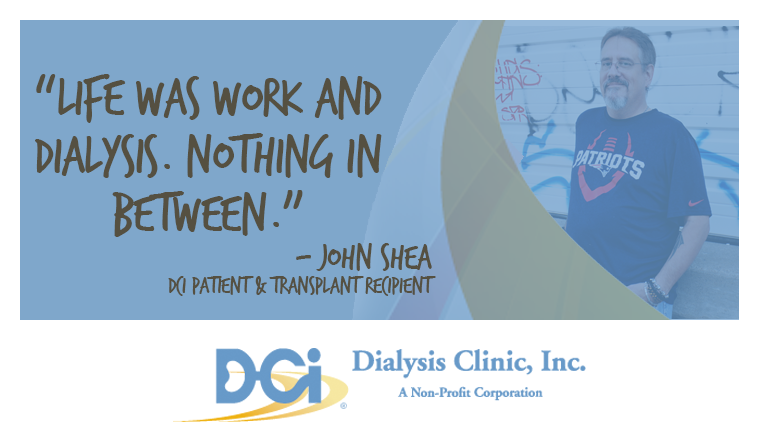 John Shea knew from a young age that kidney disease was in his genes. His grandmother was diagnosed with polycystic kidney disease in 1971, and eventually she drove 150 miles each week to reach the nearest dialysis center. His mother and aunt’s findings of kidney disease followed soon after. At 26-years-old, he was admitted to the U.S. Naval base hospital after suffering multiple kidney stone attacks during his time of service. By then, he was not surprised when he heard the verdict of kidney disease. He said it didn’t even bother him. Over the next twenty years, his kidney function steadily decreased. By 2012, his right kidney was functioning at 4-percent, and he started in-center dialysis at DCI Lebanon. John said the inability to move and the constant humdrum of hemodialysis led to depression. After consulting with his nurses, he decided to switch to home peritoneal dialysis. Almost immediately after he made the switch, his depression disappeared. “It freed up my life so much. I would recommend peritoneal dialysis to anyone because you don’t have to be in a chair all day,” he said. In his spare time, John enjoys travelling, which was possible again because of his PD treatment. He was even able to go to Vegas and have his dialysis equipment shipped there. When he wasn’t taking trips, he was busy working about 60 hours a week at a steel plant in Lebanon. 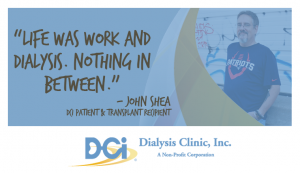 Even though the average unemployment rate for dialysis patients is 71-percent, John was determined to maintain his full-time job over the years. In fact, if he hadn’t kept working, he wouldn’t have met his kidney donor. Paul, a truck driver at the plant John still works at, heard that John needed a new kidney. After three weeks of friendship, Paul offered to see if his kidney was a match, saying he believed it’s what God wanted him to do. About one year later, on April 8, 2015, John received a kidney donation from Paul. John said he considers Paul family now, and he plans on getting a tattoo of Paul’s name on his arm, a small dedication to the sacrifice his friend made for him. These days, John arrives at DCI not for dialysis, not for home-training, but now, for post-transplant checkups. “I look forward to coming here. Doug is the only doctor I look forward to seeing, and the nurses here, they’ll do whatever it takes to support their patients,” he said. Dr. Doug Johnson said John is a positive person, even though he’s had to persevere through so many different sides of kidney disease treatment. “Despite what he’s had to do, what he’s been through, he remains happy,” Dr. Johnson said. Although John has to take a handful of pills every day now, he says the transplant was absolutely worth it. For John, life seems on the up and up, even in the smallest of details.